The more we rely on our smartphones for every facet of our lives, the more risk there is of losing important data if your phone gets lost, stolen or destroyed. Android already has some backup services built in, but the massively popular chat client WhatsApp has just announced a partnership with Google to make sure its 900 million users don't lose anything important to them. Starting today, WhatsApp users on Android will have the option to back up their entire WhatsApp history right to Google Drive. 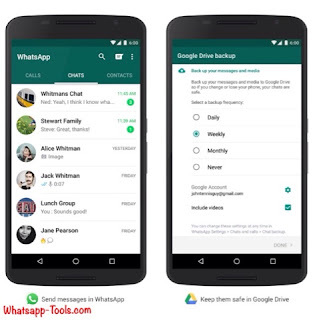 The backup will include chat histories, voice messages, photos and video, and you'll be able to restore all of that data to a new phone when you set up WhatsApp . As well as providing a handy copy for people who use WhatsApp a lot and want to archive for posterity, all the data can be restored to a new phone in a few taps when you finally upgrade/lose/break your current handset . Annoyingly, the only way to know if you’ve got the new option is to check your settings intermittently .